2019 was another big year for the Melbourne International Flower and Garden Show, over five days visitors immersed their senses in the gardens and displays showcased at the Royal Exhibition Building & Carlton Gardens. 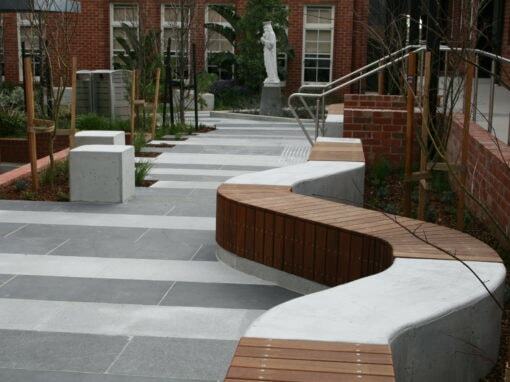 The Welcome Garden was a central feature – announcing the Victoria Street entrance to the Carlton Gardens and providing a space for events, talks, relaxation. Award-winning landscape designer, Mark Browning designed this year’s Welcome Garden. It featured sustainably certified Porta Cumaru hardwood for the decking, posts and beams for the pergola and landscaping. The natural materials added softness and warmth to the design, which was balanced with the striking mass and expanse of the loggia – creating a statement entrance.